London Irish's Samoan centre Seilala Mapusua is rapidly building a reputation as one of the most explosive backs in the Guinness Premiership. Mapasua went to school at Wesley College in Auckland and in his first year at was selected for the Under 14s. A year later it was the Under 15s, whose captain was the great Jonah Lomu. After College he moved south to Dunedin where he joined the Otago Academy. He was selected for the All Blacks Under-19 team that competed in the World Junior Championships in Wales in 1999. A year later he was winning the 2000 Colts Final with New Zealand against South Africa. Between 2000 and 2006 he played at centre for the Otago Highlanders NPC team, racking up over 70 appearances and scoring 12 tries. He also completed five Super 12/14 seasons with the Highlanders achieving the distinction of recording 50 appearances and scoring 25 points. 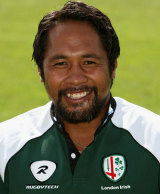 Since arriving at London Irish in 2006, Mapusua has rapidly established himself as one of the most effective ball-carriers in the game. A reflection of the universal high regard in which he is held by his peers was his receipt of the London Irish "Players' Player of the Season Award 2008-09" and the PRA "Players' Player of the Season Award for 2008-09". Mapusua appeared for Samoa at the 2007 Rugby World Cup and has also represented the Pacific Islands.